He spent his young-married years in a frumpy old house in Cheever Country. He did time as a divorced dad in an existential-nightmare flophouse in the Village. Now, Don Draper finally has a home that speaks to his success. And to the tastes of his new trophy wife, Megan. 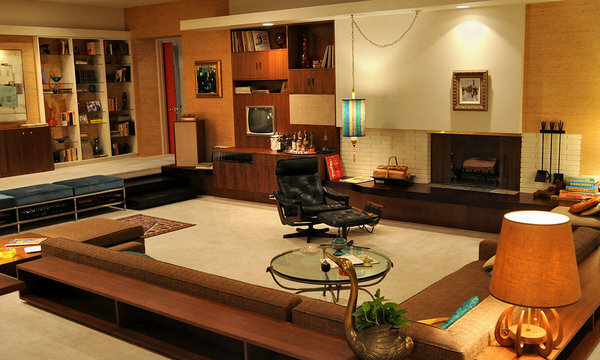 In watching Mad Men and viewing the photos of this Deluxe Apartment in the Sky (cue the theme song of The Jeffersons), one can’t help but be reminded of the Fabulous New York Apartment sets of memorable 1950s and 1960s films. Think of Doris Day’s career girl apartment in Pillow Talk. Frank Sinatra’s bachelor pad in The Tender Trap. Conjure up Marilyn Monroe, Lauren Bacall and Betty Grable sunning themselves on the terrace in How to Marry a Millionaire. Recall Uncle Bill’s posh space in Family Affair. The Sunken Living Room/Conversation Pit! The white carpet! The hanging lamp! If Darrin Stevens had a pied-a-terre, this would be it. 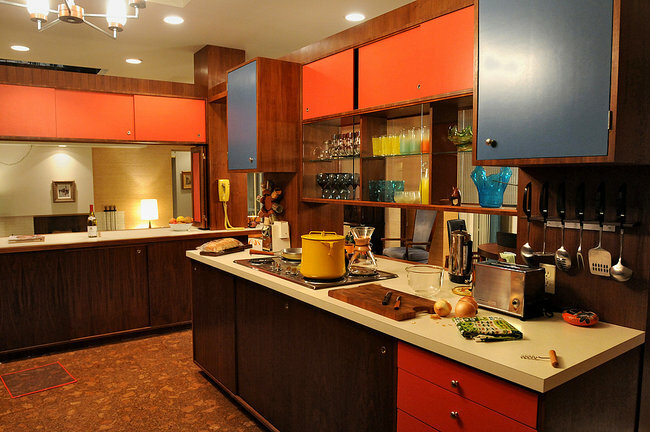 Look at the kitchen in the Drapers’ apartment, and one expects Alice from The Brady Bunch to saunter into the sea of orange plywood, Harvest Gold and Formica. 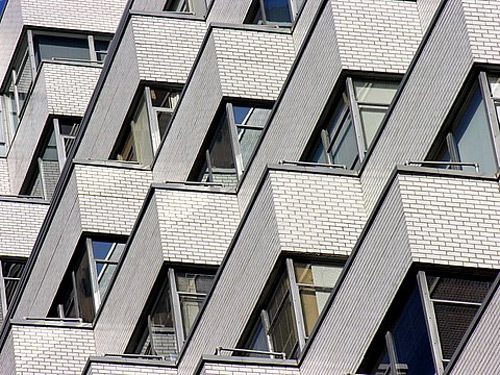 According to Mad Men production designer Dan Bishop, the apartment is supposed to evoke a unit in a high floor on one of those ubiquitous glazed white brick high-rises designed by Sylvan and Robert Bien. Incidentally, Robert Bien, in a 2000 New York Times interview, defended his use of the building material, as well as the simple functionality of the boxy apartments. Does Draper’s building look like this? Will Don and Megan live happily ever after? Will I go back to focusing on Chicago Treasure Houses? Yes, and thank you, dear reader, for indulging me in my homage to my favorite TV show.